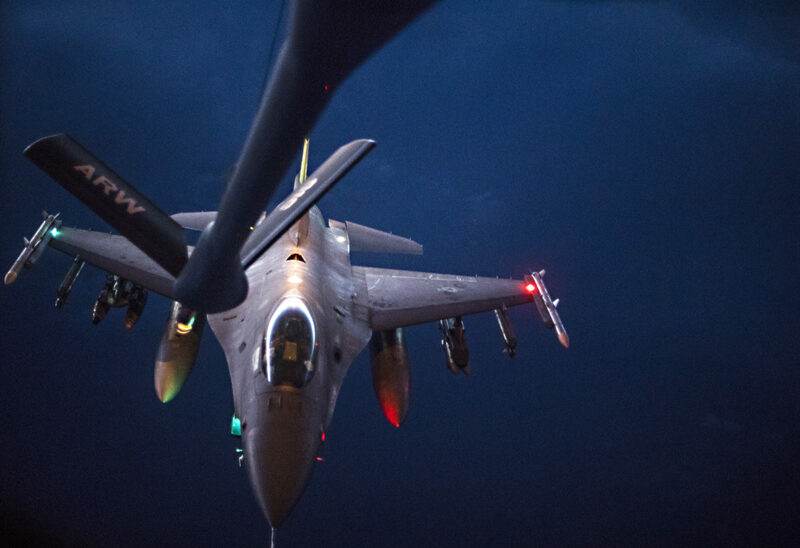 A U.S. Air Force F-16 Fighting Falcon approaches the boom of a KC-135 Stratotanker assigned to the 28th Expeditionary Air Refueling Squadron to receive in flight fuel during an aerial refueling mission in support of Operation Inherent Resolve over Iraq, Sept. 12, 2018. The F-16 Fighting Falcon is a compact, multi-role fighter aircraft. It is highly maneuverable and has proven itself in air-to-air combat and air-to surface attack. It can locate targets in all weather conditions and detect low flying aircraft in radar ground clutter. Air Forces Central Command employs full-spectrum air component capabilities in air, space and cyberspace to defeat enemies while promoting security and stability in the region. The United States is postured to defend U.S. forces in the region from any threat. 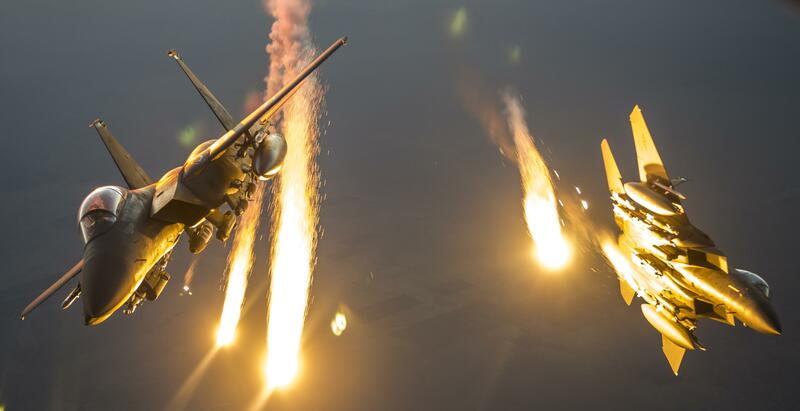 An F-15E Strike Eagle flies over Iraq May 5, 2018. The F-15E is a dual-role fighter designed to perform air-to-air and air-to-ground missions. An array of avionics and electronics systems gives the F-15E the capability to fight at low altitude, day or night, and in all weather. The F-15 is a nimble, speedy fighter that has made a living on outpacing and outmaneuvering its opponents. It’s official high speed is 1,875 miles per hour, or roughly Mach 2.4. That being said, there are reports of F-15s going faster than that. At Mach 2.4, that puts the F-15 behind only select few American-made jets for top speed. The SR-71 Blackbird, the Lockheed’s YF-12 (Blackbird predecessor), and the XB-70 Valkyrie are the only jets made in the USA that are faster than the F-15. The F-15A’s first flight was in July of 1972. TF-15A (training), which subsequently became the F-15B, flew for the first time a year later, in July of 1973. The F-15C and F-15D were introduced at the end of the decade, in 1979. The F-15B and F-15D are twin-seat versions of the aircraft while F-15A and F-15C are single-seat. 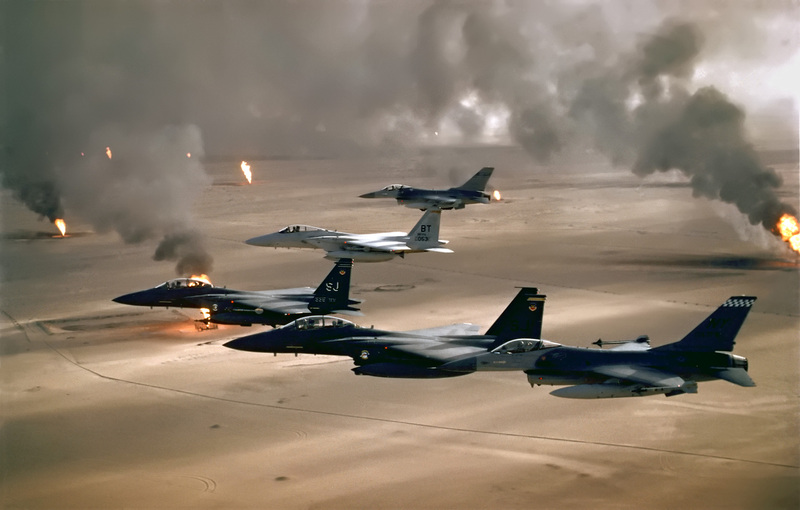 The F-15E model was introduced in the late 1980’s and saw time almost immediately during Operation Desert Storm in 1991. How much does it cost? Well, which one are you talking about? The F-15, as you just read, has multiple iterations over the years. With each new variant came new modifications. Some relate to engine, some relate to avionics, some relate to the frame…the point is. 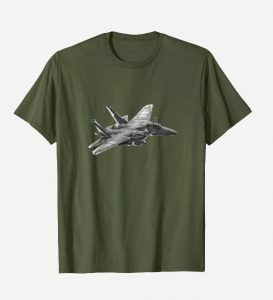 There isn’t a static answer to the cost of an F-15. That being said, the current versions used by the Air Force – the F-15C, F-15D, and F-15E – cost approximately $29.1 million dollars by today’s dollars. Eighteen U.S. Air Froce F-15 Eagles from Kadena Air Base are parked on the ramp, July 9, 2018, at Yokota Air Base, Japan. 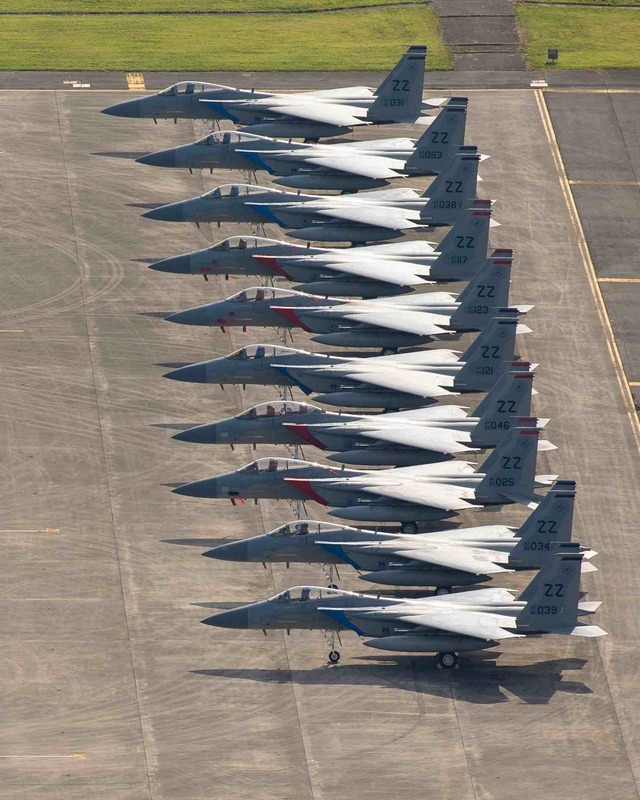 The F-15s evacuated due to Typhoon Maria. This is the most aircraft to ever evacuate to Yokota AB from Kadena AB. 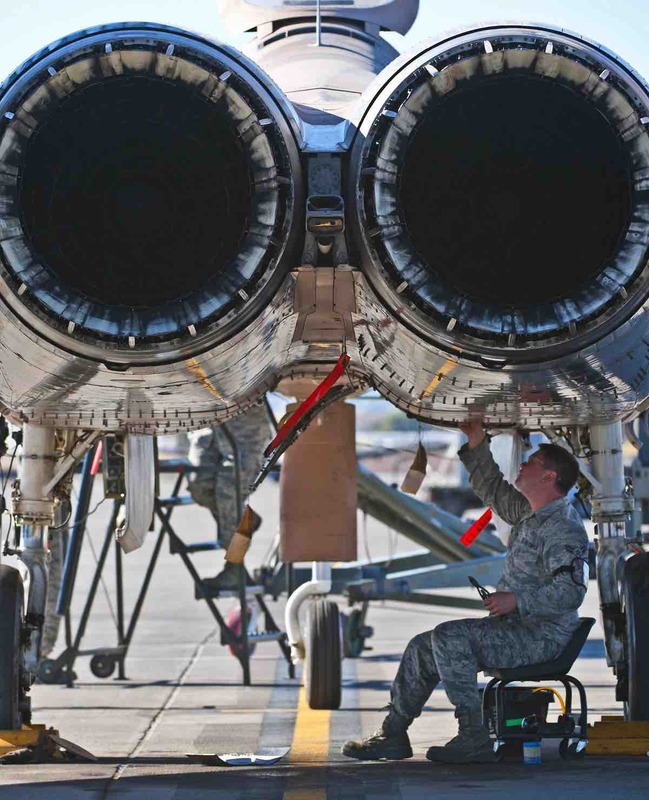 The F-15 is beloved by so many, and the reason is that it’s personal for so many. This aircraft has been around for a long, long time and has had a chance to gain millions of supporters. It flew for the first time in 1972 on the curtails of the Vietnam War and the MiG-25 Foxbat. The first Eagle that saw combat was delivered in 1976. 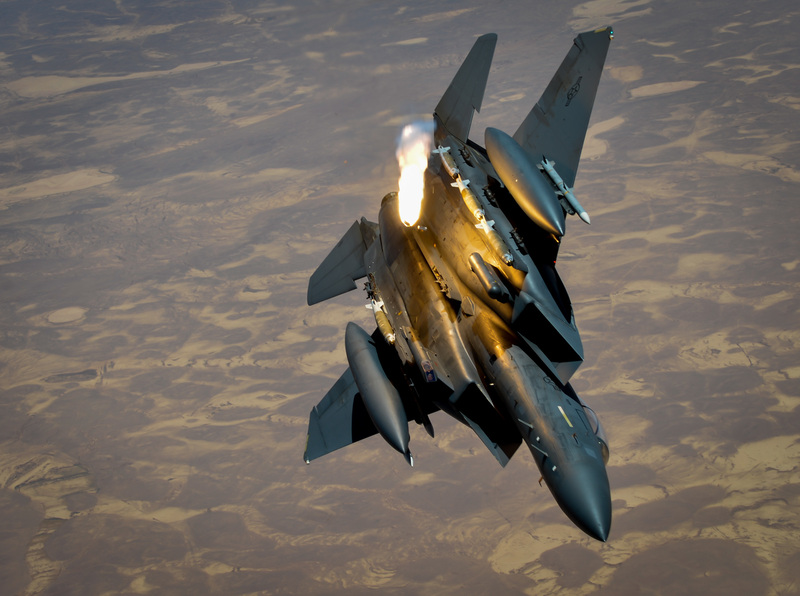 The F-15 participated in most major conflicts since then, most recently during Operation Inherent Resolve over Iraq and other Middle Eastern territories. Including the three external fuel tanks, ferry range is roughly 3,450 miles – or 3,000 nautical miles. However, with in-air refueling capability – range of the F-15 is essentially unlimited as long as tanker planes are available. 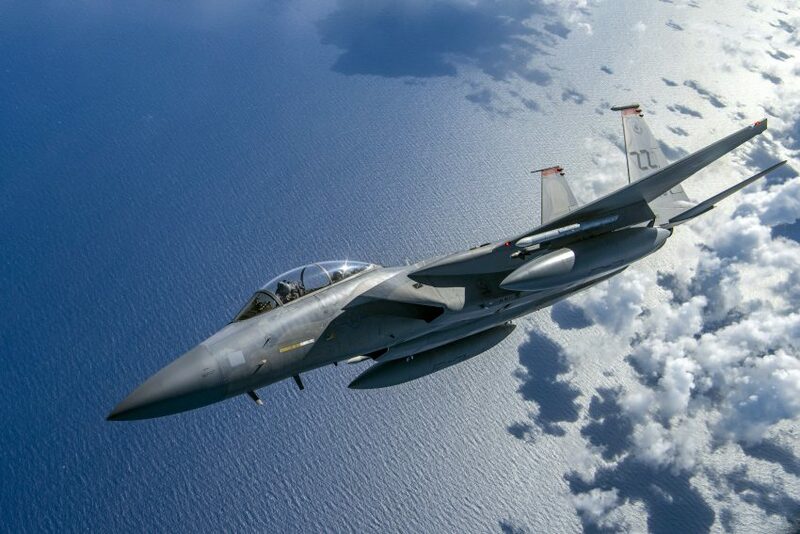 “The advanced mission computer, based on commercial technology, provides multi-core processing capabilities propelling the F-15 to the forefront of fighter embedded computing systems. The ADCP II high-speed processing and interface designs enable advanced systems integration, increased mission effectiveness, augmented fault-tolerance, enhanced system stability and aircrew survivability. The ADCP II is pivotal to F-15 upgrades enabling air superiority. It provides critical mission processing capacity for new advanced capabilities such as the Eagle Passive/Active Warning Survivability System, long-range infrared search and track capability, high-speed radar communications, and future software suite upgrades.” – 88th Air Base Wing Public Affairs. A U.S. Air Force F-15E Strike Eagle departs after receiving fuel from a KC-135 Stratotanker in support of Operation Inherent Resolve June 23, 2017. The F-15E Strike Eagle is a dual-role fighter designed to perform air-to-air and air-to-ground missions. 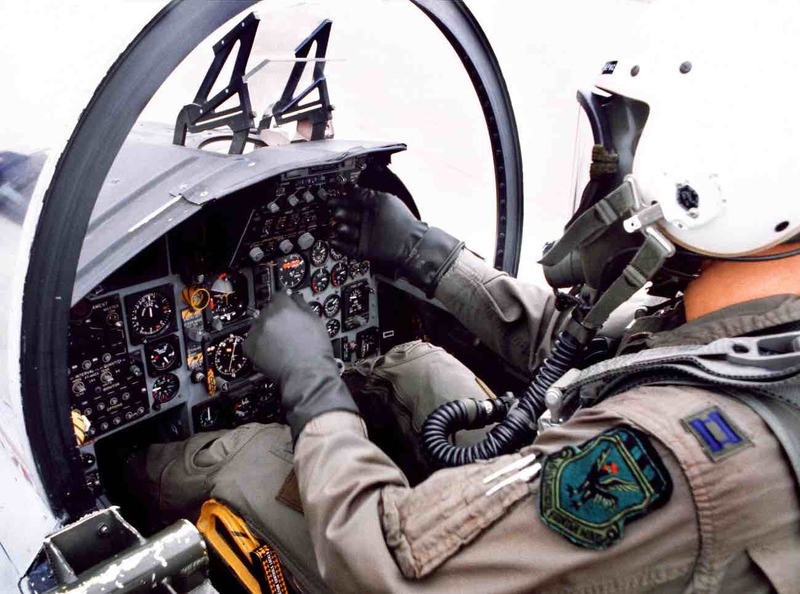 An array of avionics and electronics systems gives the F-15E the capability to fight at low altitude, day or night, and in all weather conditions. The F-15A/B/C/D models contain a 20mm cannon, AIM-120 (AMRAAM) missiles, AIM-9 (Sidewinder) missiles, and AIM-7 (Sparrow) missiles for air-to-air combat. According to the manufacturer’s site, Boeing lists the F-15E as containing precision guided munitions and a variety of missiles and bombs. However, it’s likely the same or similar AMRAAM missiles are used. The F-15 was designed with the United States in mind, but it has expanded all over the world since then. Currently the U.S., Japan, Israel, South Korea, Saudi Arabia, Singapore, and Qatar operate F-15’s. The international variants differ slightly from the United States version – but they’re essentially the same aircraft. All in all, over 1,500 F-15’s have been built – making it one of the most numerous military aircraft on Earth. The F100 engine was delivered in 1989 and declared combat-ready in 1992. Each engine outputs 29,160 pounds of thrust, and weighs over 3,800 pounds. The engine is 191 inches long, with an inlet diameter of 34.8 inches (maximum 46.5 inches). Its overall pressure ratio is 36 to 1. The F-15, in any of its variants, has never been shot down by an opposing force. Its most successful missions were during the Gulf War, the Lebanon War, and the Syrian Border Crisis. 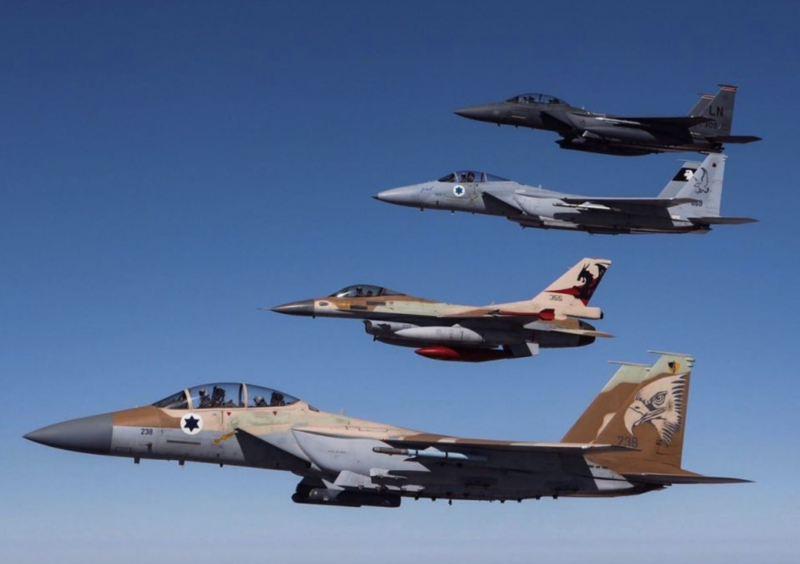 The success during the last two of those conflicts came from F-15s flown by the Israeli Air Defense Force. Overall, the F-15 is presumed to have an outstanding batle record fo 102 kills to 0 losses. Amazing. 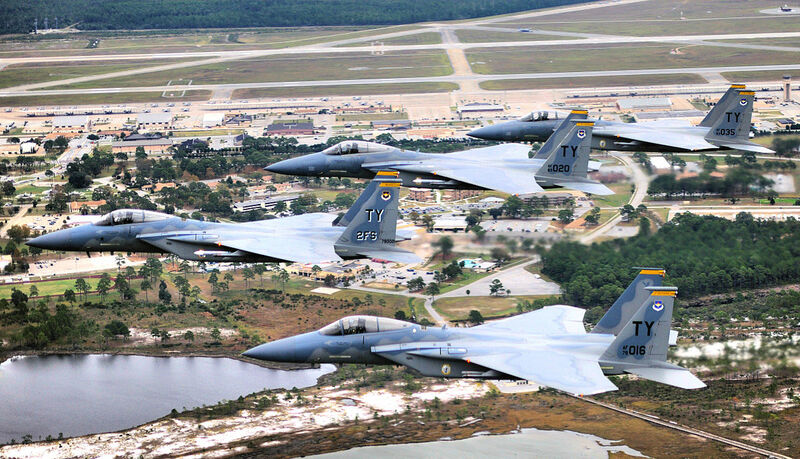 F-15s over Tyndall Air Force Base, Florida. Only the Su-35 has a higher thrust-to-weight ratio than the F-15. The F-15K (Republic of Korea) has a listed thrust-to-weight ratio of 1.29. The SU-35S has a listed thrust-to-weight ratio of 1.30. Almost to close to call! 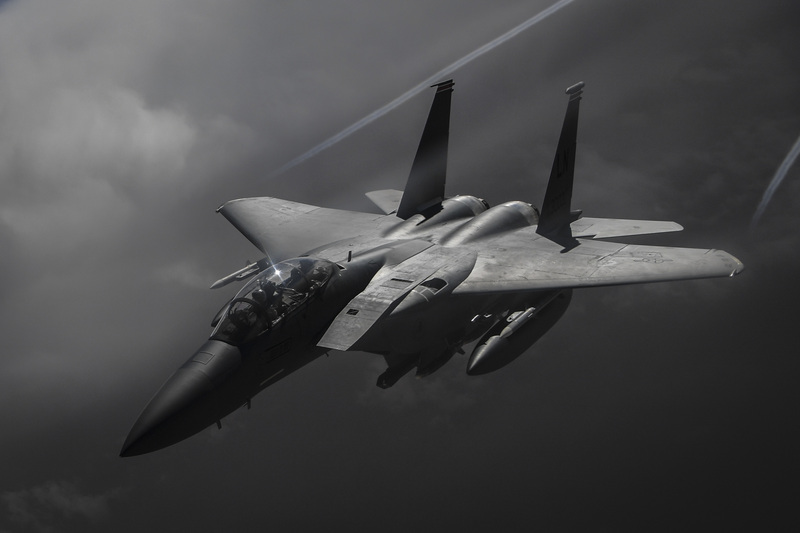 American F-15s have a thrust-to-weight ratio of 1.19 – about 7th place on the list. This high ratio for F-15s is what gives it its trademark speed and maneuverability which is why it has such a perfect combat record. A U.S. Air Force F-15E Strike Eagle receives in-flight fuel from a KC-135 Stratotanker Oct. 25, 2018, while flying over Iraq in support of Operation Inherent Resolve. The F-15E was designed in the 1980s for long-range, high-speed interdiction missions. 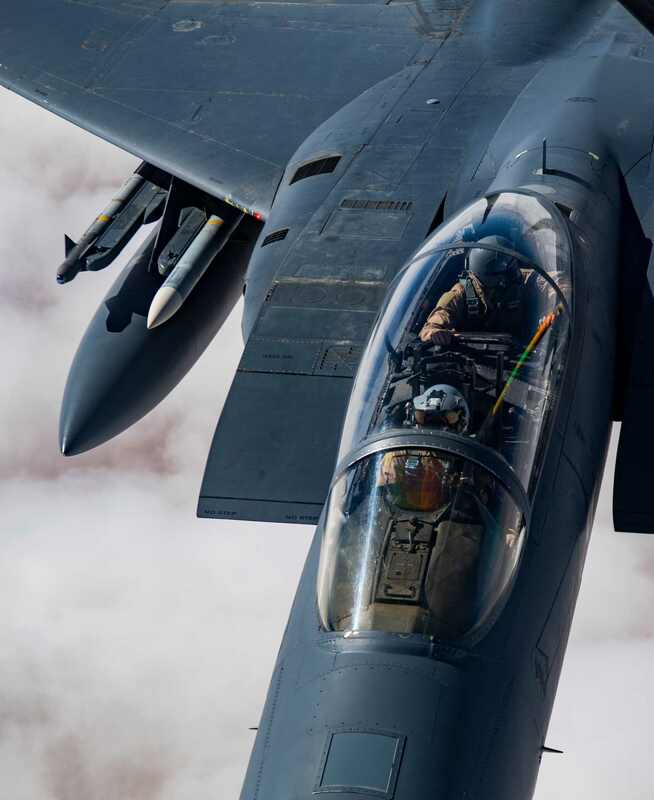 The features on the inside of the F-15 cockpit are some of the most advanced in any fighter in the world. Not as advanced as the F-22 or F-35…but still, impressive technology. We won’t bog down this post with all of the specifics. For the 21 most important tools inside the cockpit of the F-15 and even more F-15 facts, click here. Oh, and enjoy the first-person video from the cockpit on that page as well! The F-15 Eagle was nearly an aircraft carrier-based plane. McDonnell-Douglas, in the early 1970s, was quite serious about the idea of creating the F-15 with foldable wings and stronger landing gear in order to make it adaptable for the U.S. Navy. Had that been the case, you may have seen Tom Cruise in an F-15 instead of a F-14 Tomcat. One of the coolest F-15 facts out there! Thanks for viewing these F-15 facts. We think you’ll enjoy these F-22 Raptor facts next!